The Romance Dish: Do You Believe? 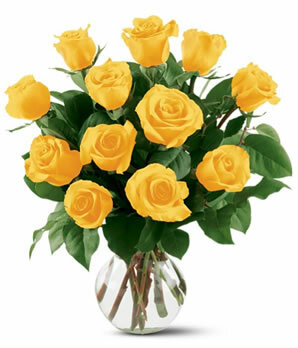 I love yellow roses; they're my favorite flower. For our 25th wedding anniversary, my husband gave me (among other things) a yellow rose bush. Mind you, I'm not exactly known for my green thumb. In fact, plants have been known to cringe in terror when they see me coming - my husband joked that I could kill a silk plant and he wasn't far from the truth - but I planted that beautiful yellow rose bush in my garden and was determined that it would flourish. It did. For about three months. In July of that year, my husband was diagnosed with Stage 4 cancer, just one more challenge in a long list of health challenges that had beset him over the previous five years. 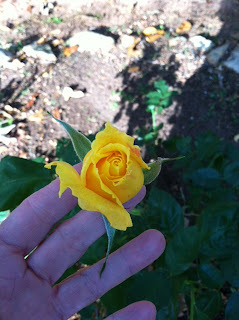 For the next eleven weeks I pretty much lived at the hospital and the yellow rose bush was forgotten. The leaves dropped from its vines and no flowers bloomed. 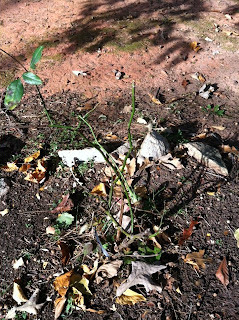 My husband died in late September of that year and I was sure the roses had died with him for I had never seen a more lifeless looking plant in my long, less than illustrious, gardening career yet I couldn't bring myself to dig it from the ground. It was the last gift he'd given to me, you see, and throwing it away would be like losing him all over again. I met my husband when I was in my early twenties and there was an instant connection between us. Was it love at first sight? Definitely lust but probably not love. That needed time to grow. There was, however, a "knowing." I looked into his beautiful eyes for the first time and knew this man was going to play an important role in my life. By the time we married a year later, he had become my heart, my soulmate, and my best friend. We had a beautiful life together (and, as you can see from the Halloween photo on the right, a lot of fun!) and treasured every moment. Imagining life without him was heartrending but that's exactly what I was forced to do that last summer. He didn't want a funeral. Instead, he wanted me to wait until I was ready then have a party, a "Celebration of Life" with family and friends where we could gather and rejoice in the wonderful life with which he had been blessed rather than mourn the fact that he was no longer with us. He also made me promise that after he was gone, I would move on and find joy in life. He worried about that. Didn't want my smile to fade, didn't want my laughter silenced. He used to joke that he'd come back to haunt me if I let sadness consume me. He probably would have too. Okay, so back to the rose bush. It was dead; I was sure of it. No leaves, no roses, no sign of life through the rest of September and October. Just a sad collection of withered vines. I had chosen the first week of November to hold my husband's Celebration of Life and had finally made the decision to dig up the rose bush afterwards. On the morning of the party, when my heart still missed him but was also content, knowing that he was finally pain-free and at peace, I walked down my driveway to get the morning paper. Halfway down, I jerked to a sudden stop. There, in the garden was that sad little bedraggled bush with one beautiful, perfect, yellow rose bud. He knew. He knew that I was going to be okay, that I would always love him, would always hold him in my heart but that I would find joy again. I never dug up that bush. It still sits in my garden, eleven years later. It gifts me with a few roses throughout the year but most of the time it's a lifeless looking little plant with few leaves and no flowers. BUT! Every year, on the morning of the date that I gathered with family and friends to celebrate my husband's life, that rose bush gifts me with a beautiful yellow rose. Sometimes it's just the one bud. Sometimes it's two or three. Here's what I found this week, on the morning of the Celebration date. There hadn't been a flower on the bush since August. Coincidence? Maybe, but if so, it's one heck of a coincidence that has happened every single year on the same date. For eleven years. I like to think it's my very own guardian angel letting me know that he's watching over me and happy with the joy that I continue to find in each day of my life. Have you ever experienced a connection with the beyond? Ever had a ghostly encounter? Premonition? Ever attend a seance? Do you believe? Or, do you think it's all just a weird coincidence? PJ how lucky you were to have such a speical man in you life.. God Bless him and you. Kathleen, my prayers go with you today as you honor your loved ones. What a beautiful, heart-wrenching part of your life to share with us. God bless you. LSUReader, it was heart-wrenching at the time but the memories now are sweet. Thanks for stopping by! What a lovely story. 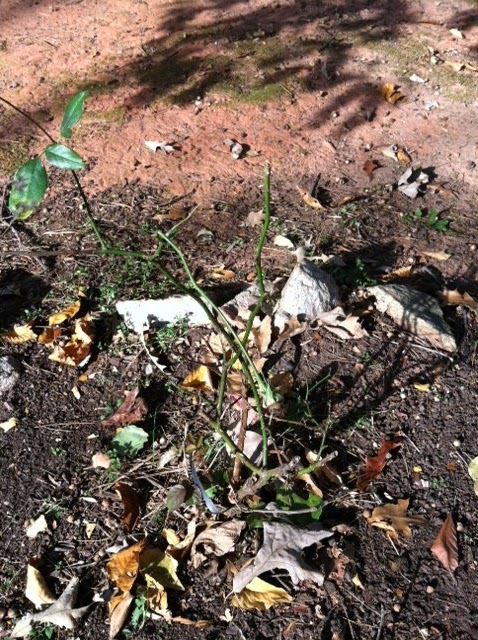 I have a rose bush that my grandmother rooted and gave to me. We have moved it three times. The house where we now live has been a very happy place for the rose, it has flourished. Yes, it often blooms at odd times when I need a little pick me up. I like to think that my grandmother is giving me a sign that she is still with me. Scarlet, I have no doubt that's exactly what your grandmother is doing. What a lovely legacy she has left you. I too have tears for such a sweet and poignant story. Thank you for sharing. The older I get, the more I hear these kind of stories. A close friend of ours lost her 42 yr. old son to suicide a few years back. She has always had this connection with butterflies and on the day of his funeral, one landed on her! Another time when she was having a very bad day, while stuck in traffic for hours, a butterfly landed on her car and stayed with her even when the car started moving and stayed with her until she felt better. She has had many such "coincidences" since then. I have to say I believe all things are possible! I believe your husband is giving you a wonderful sign! I am so sorry for your friend's loss, catslady. I too believe all things are possible and those butterflies that soothe your friend are one more story among many that have convinced me these are more than coincidences. And that love will live on and never leave." Oh, Janga, that is one of my favorite songs. Such beautiful lyrics. Josh Groban never fails to move me to tears when I hear him sing it. That's a beautiful story and a wonderful connection to your husband. Thank you, Kim. While there were plenty of tears eleven years ago, the roses now bring joy to my heart every time they bloom. Yes, Erin, it is amazing and something for which I am very grateful. I love that! 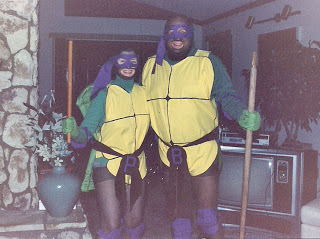 My parents show up here and there at odd moments when I could really use them. My mother was enamored with butterflies, so when she died, and my daughter was young, we'd say "Hey Nana!" every time we'd see one. In the last few years, when I've had some struggles or when my first book was pubbed and I was feeling down that they weren't there with me, a beautiful butterfly floated by. If I'm outside and think of her, one shows up...every time. And at my brother's second wedding, it was outdoors, and in the middle of their vows, the hugest monarch butterfly flew all around us and between them. I was a soggy mess. LOL. Great post! Sharla, I'm a soggy mess just reading this! Thank you so much for sharing your story with us. What a special gift you've given your daughter and you know what? I have no doubt Nana has been with you for all those important events! (((Leah))) I would have been right there with you crying over the plant. I'm so sorry it died but glad for all the joy and pleasure it brought you during it's lifespan. PJ, what a lovely post. I teared up while reading it. I believe that is indeed a sign he is watching over you. (((Hugs))) to you, my friend! What a lively tribute to your husband!! It is most definitely a sign from beyond. A gentle, sweet reminder that he is still with you. Thanks for sharing with everyone. Oh, PJ, that was so sweet. I totally cried. Oh, I love that! Thank you! What an heartwrenching story! I believe, PJ. I do believe in guardian angels, in premonitions, in the miracle of your yellow roses. I believe too, Mina. And while it was heartwrenching at the time, I'm in a good place now. My life is filled with joy and the memories are sweet. This story its so beautiful. I do believe, I think everyday we receive messages from the ones we lost, I think its their way of letting us know they are okay and that they love us. I think so too, Savannah. That is such an amazing story, brought tears to my eyes! I've dreamed things that happen soon after I dream them. I also have had a strong feeling to contact someone to find out that they were hurt or in need. I once had an urge to contact a pregnant friend but couldn't reach her, so contacted a mutual friend to go check on her. I found out later she went into pre term labor, with her husband out of town and the friend I sent out found her and took her to the hospital and everything turned out well. Not the same as your amazing story but enough to make me believe there is something higher then what we can see! What a beautiful story. And, yes, I do believe in connections with the beyond.